The Milwaukee Brewers today named Darnell Coles hitting coach. Coles, who was signed to a one-year contract, replaces former hitting coach Johnny Narron, who was relieved of his duties on October 10. The announcement was made by President of Baseball Operations and General Manager Doug Melvin. Coles, 52, returns for his second stint in the Brewers organization, having served as minor league hitting coordinator from 2010-11 and as manager at Double-A Huntsville from 2012-13. He spent the 2014 season as assistant hitting coach for the Detroit Tigers, his first career coaching position at the Major League level. The Tigers offense led the Major Leagues in batting average (.277), hits (1,557), RBI (731) and doubles (325) and ranked second (led the American League) in on-base percentage (.331), slugging percentage (.426) and OPS (.757). Coles began his coaching career in 2000 as minor league hitting coordinator with the Seattle Mariners. From 2001-06, he served as an analyst for ESPN. His coaching career resumed in 2006 as minor league roving hitting instructor with the Washington Nationals and followed with roles in the organization as manager at Class-A Vermont (2007) and Class-A Hagerstown (2008) and as hitting coach at Triple-A Syracuse (2009). Coles played 14 Major League seasons and batted .245 with 75 HR and 368 RBI in 957 games. The former infielder/outfielder played for Seattle (1983-85, ‘88-90), Detroit (1986-87, ‘90), Pittsburgh (1987-88), San Francisco (1991), Cincinnati (1992), Toronto (1993-94), St. Louis (1995) and Colorado (1997). He was a member of the 1993 World Series champion Blue Jays. Coles and his wife, Shari, reside in Tampa, Florida. They have three children, DeAnna, Darnell Jr. and Jared. The Milwaukee Brewers today announced that Ron Roenicke will be the team’s manager for the 2015 season. Roenicke, who has compiled a career 335-313 record as manager since taking over for Ken Macha following the 2010 season, was already under contract for the 2015 season but speculation was rampant over the final month of this past regular season and the days since that his position was in doubt. That was fueled by the Brewers historic collapse over the final six weeks of the season, one which saw Roenicke’s team topple from 16 games over .500 on August 20th to a mere two games north of even at the end. From 71-55 to 82-80. That’s 11-25 during that stretch including a nine-game losing streak that kicked off a stretch of 13 losses in 14 games. After a small rebound at home in mid-September, one which left the team still capable of controlling whether they got into the playoffs, they slammed back down off their bounce with a thud during the season’s final road trip, a brutal three-city, nine-game NL Central tour. 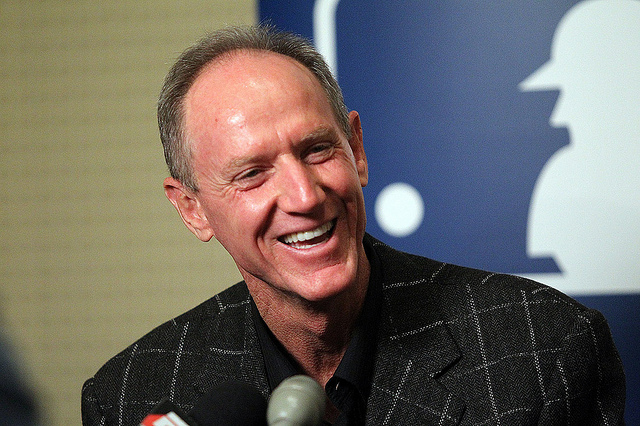 Apparently the Brewers’ brass felt that enough of the blame did not lie with Roenicke. As the players would (and did after the final game) tell you, the fault lies in their own physical and mental failures. Those that spoke about the season’s shortcomings said that they needed to play better and more consistently. Only so much of that is on the manager in any case. They often get too much credit for success and too much blame for failure. Despite Roenicke’s staying in town, hitting coach Johnny Narron’s contract will not be extended beyond it’s October 31, 2014 expiration date. Too many hitters performed too poorly for too long for a change there to be avoided. The rest of the dugout staff felt more secure (more on that in a different column as time allows), though it was also revealed that Garth Iorg will not be offered a new contract for 2015 with the organization. If you have a grievance with one of the coaches that you feel deserves having him replaced, please share your thoughts in the comments. The bottom line on this one feels as though the Brewers value stability at their managerial position and likely believe that making a change in what could be the final year of the current window of contention would cause more tumult than it’s worth. The Brewers won the 2008 NL Wild Card, and were viewed as likely to contend in 2009 & 2010. However, after the Brewers fired Ned Yost at the end of 2008 and gave the reins to Macha for two seasons, they slogged through back-to-back losing campaigns. Roenicke took over in 2011 and won the division by winning 96 games. Much of that is the imported pitching talent that arrived over the preceding winter, but some of the credit does go to the different voice in the locker room. These players respect and like Ron Roenicke. Contrary to some opinions out there, Roenicke has not “lost the locker room” at all. Sometimes you need to change the voice. That’s an adage probably as old as baseball itself. This isn’t that time for the Brewers in the case of Ron Roenicke. UPDATE: Here is the Brewers press release on the topic. The Milwaukee Brewers announced today that the team will not be offering 2015 contracts to hitting coach Johnny Narron and first base/infield coach Garth Iorg. Manager Ron Roenicke, whose 2015 club option was exercised this past Spring Training, and the rest of the coaching staff will return next season. Narron served three seasons as hitting coach. He was named to his position on November 28, 2011, replacing Dale Sveum, who was named manager of the Chicago Cubs. Iorg served four seasons as first base coach. He was named to his position on November 15, 2010. Returning to the coaching staff for the 2015 season will be coach Mike Guerrero (2nd season), pitching coach Rick Kranitz (5th season), bench coach Jerry Narron (5th season), third base coach Ed Sedar (9th season, 5th as 3B coach), outfield coach John Shelby (5th season) and bullpen coach Lee Tunnell (4th season). A few funny things have happened on the way to June. While the Brewers have been slogging through a seesaw month of May (two and six in their first eight, five and one in the next six, one and five in the six after that, five and two in the most recent seven games entering play on May 31st), they’ve tinkered and toyed with some things that we simply wouldn’t see — because we haven’t — in recent history. First, the Brewers posted their May 24th lineup and it featured a major change. After a day off to rest his tweaked oblique, rightfielder Ryan Braun was back in the lineup but he was hitting second. It’s a move that sabermetricians would love as there is plenty of statistical evidence that the second spot in the lineup is the most efficient and productive spot for your “best” hitter. Braun and his offensive brethren would falter in that game from a run production standpoint as they would only score once despite 11 hits. (It was Braun that scored the run, for what it’s worth.) But this would not be a one day trial that manager Ron Roenicke would abandon due to lackluster results in the columns of R or W.
Roenicke explained his thoughts after the game, more or less, and confirmed that this was the plan for a while. Truth be told, it started in phases even though that might not have been by design. Season-long leadoff hitter Carlos Gomez needed a day off two days earlier on May 22. It was that day that Roenicke moved Jean Segura up to lead off for Milwaukee. Segura responded by going 3-for-5 with two runs scored in a loss to Atlanta. When Gomez returend on May 23, Roenicke left Segura at the top and inserted the powerful Gomez in the cleanup position. That was seen as a reaction to Braun being out and moving Jonathan Lucroy up to Braun’s customary third spot. It was seen as a blip and scarcely even mentioned let alone thought deeply about. Then Braun returned on May 24 and Segura, Lucroy and Gomez held their positions as Braun slid in at number two. The offense has been on a tear since that 22nd of May, tying a franchise record with at least 10 hits in 10 straight games. All this has happened without Aramis Ramirez, and it’s almost June 1, which we collectively know as Aramis Ramirez Day. If he comes back (scheduled for Wednesday in Minnesota and likely DHing) and doesn’t take long to warm up, the offense could really make a splash early in the second third of the season. But there is more going on than just a significant lineup change. On that same May 24 in Miami, the Brewers outrighted Jeff Bianchi to Triple-A Nashville after he cleared waivers. Bianchi, who is out of options, has been outrighted off of a 40-man roster before in his career and therefore had the right to refuse this assignment thereby electing free agency. He eventually decided to stay, but the point here is that there was more going on than simply swapping one utility infielder for another (they called up Irving Falu, but you know that). The Brewers of the recent past would not risk losing an asset, even one grossly underperforming as was Bianchi, by outrighting them. This is a front office displaying more of a sense of urgency than even they themselves did this off-season by signing Matt Garza and bolstering a rotation that many assumed they’d just fill in house with five readily identified arms. That they were willing to shake up their lineup, one that had been struggling to score runs shortly beforehand, and outright Bianchi at all speaks to the team’s desire to sustain their position atop the National League Central. They are not going to stand idly by, subscribing to the Ned Yost School of Thought that once infamously and dismissively reminded worriers that his Brewers were “still in first place”. No. These Brewers, while still in first place, were seeing a once large lead begin diminshing as perennial division rivals the St. Louis Cardinals began to find their stride a bit while the Brewers scuffled. Their lead was down to 1.5 games as recently as May 27. Milwaukee is certainly striding right at the moment as they’ve won their last three with St. Louis losing its last three and the division lead entering play on the last day of May was back up to 4.0 full games. Complacency and status quo are not seemingly in the toolbox of the 2014 Milwaukee Brewers. Kudos to them for yet another day alone in first place (where they’ve been since April 9) but more so they deserve accolades and attention for not just thinking that was good enough. What’s more? They aren’t necessarily done. They could consider changes in their first base platoon, including dumping the defensively solid but weak-sticked Lyle Overbay. They could juggle their bullpen pieces a bit which they’ll have to do when Tom Gorzelanny is ready but there’s certainly room for more if they desire. They could certainly continue to tweak their bench and bring in a more powerful option their the currently versatile yet light-hitting duo of Falu and Elian Herrera. And if someone doesn’t perform in that rotation or if they need to use a piece to get a piece elsewhere, they could make the decision to go with Jimmy Nelson at some point. The bottom line is that if they decide to stand pat this season it won’t be due to a lack of want to change nor will it be due to any apprehension thereof. This is a front office that not only sees the benefits in making moves, but certainly won’t be lured in by making a change for the sake of change. It’s a different feeling than we’re used to as fans over recent history, but it’s certainly a welcome one. Following his season debut (5.2 IP, 5 H, 0 R, 3 BB, 6 K), spot starter Jimmy Nelson was optioned back down to the minor leagues. As I said on Twitter at the time, it was an exciting glimpse at a piece of the Brewers future. Nelson had a number of high leverage moments in his start and got through them all with high marks. 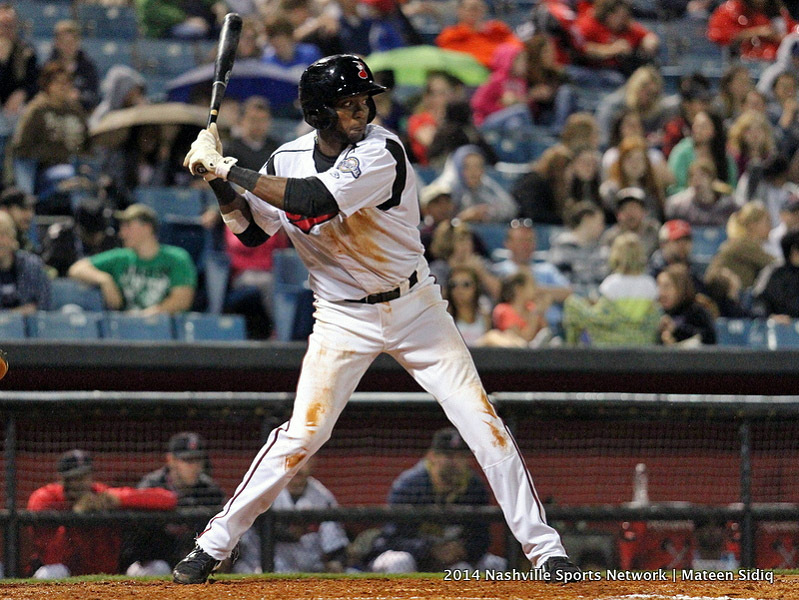 In his place, the Brewers filled their opening on the 40-man roster and strengthened their bench by purchasing the contract of infielder Irving Falu from their Triple-A affiliate, the Nashville Sounds. Falu fills the open spot on the Brewers’ 40-man roster that was vacated when utility man Jeff Bianchi was outrighted to Nashville following Saturday’s game in Miami. Falu, 30, will join the Brewers as they arrive home following their season-long 10-game road trip. He brings with him a .280/.342/.333 slash line in 38 games for the Sounds. He has also appeared in 14 games defensively at shortstop, including 12 starts. That’s a key note because when the Brewers decided to outright Bianchi to Nashville, they did so knowing that they preferred a replacement who could help fill the void as a backup defenseman, especially at the crucial position of shortstop. Falu is skilled at second base and third base as well, once again providing quality versatility. Like Elian Herrera who has also been tapped more than once this season in no small part because of his defensive versatility, Falu is a switch-hitter. Unlike Herrera, Falu’s career handedness splits aren’t as drastic at all. In 2014 for Nashville to this point though, he’s slashing .314/.386/.392 as a right-handed hitter but only .259/.315/.296 as a left-handed hitter. Still, Falu should be capable of proving a nice boost off the bench where Bianchi had been faltering of late. It remains to be seen exactly how Ron Roenicke orders his defensive depth chart, but the Brewers field manager is on record as liking the game of Falu who was one of the final players cut in Spring Training. Hopefully he performs better and more consistently than did his predecessor. Nearly thirty Milwaukee Brewers players plus a host of alumni, coaches, front office executives and broadcasters are scheduled to participate in Brewers On Deck, presented by Time Warner Cable, which is set to take place on Sunday, January 26 from 10 a.m. – 5 p.m. at the Wisconsin Center. 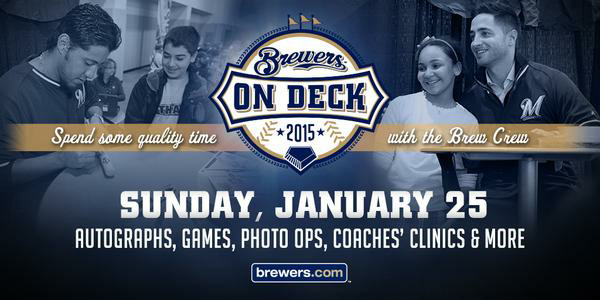 Brewers On Deck will feature a number of activities for the entire family. Autographs and photos from Brewers players, coaches and alumni; interactive games in the Kids Area; Q&A sessions and game shows with Brewers players, coaches and broadcasters; vendor booths with baseball memorabilia; Brewers Community Foundation’s Treasure Hunt and many other activities will all be a part of Brewers On Deck.